2012 Mini Coupe Cooper S review | What Car? 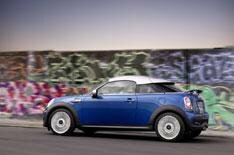 The Mini Coupe Cooper S will be the most tempting version of Mini's slinky little sports car for many buyers. It costs a fair bit more than the entry-level 120bhp Cooper version, but you get a lot more power for your money a useful 181bhp. On the flipside, the Cooper S is 27bhp down on the range-topping John Cooper Works version, but it'll cost you far less to buy and run. This means, in theory, that the Cooper S occupies the sweet spot in the Mini Coupe range. What's the 2012 Mini Coupe Cooper S like to drive? The Cooper S isn't quite as devastatingly fast as the JCW, but it still fizzes along very quickly indeed. Importantly, the turbocharged 1.6-litre engine in the S has the same low- and mid-range punch as the one in the JCW, so the power delivery feels just as eager. Compare this with the Cooper's merely adequate performance, and the S feels like a different car altogether. Quick, precise steering and sharp responses from the throttle and brakes ensure the car reacts instantly to your instructions. Throw in the strong grip, neutral balance and strong body control, and the Coupe is supreme fun along a country lane. Granted, the stiff suspension means you feel plenty of the road surface, but things get crashy only if you're on a particularly poor section of road. It's just a pity the Cooper S suffers the same poor motorway refinement that blights all Mini Coupes; there's a barrage of road noise at the motorway limit, and while the engine sounds delicious when you're accelerating (the exhaust pops and crackles satisfyingly), it drones annoyingly at 70mph. What's the 2012 Mini Coupe Cooper S like inside? The interior will be familiar to all Mini owners. The materials used are great in places, but rather disappointing in others. Then there's the dashboard, which has the same overly styled, poorly located switchgear you get in all the company's models. If you add the optional Media Pack (1330), though, the sat-nav, stereo and various other functions are controlled through a more user-friendly infotainment interface based on BMW's iDrive system. Practicality isn't bad for a two-seater, either. The Coupe has a reasonably large 280-litre boot with wide access, and a hatch between the boot and the cabin. You'll love the Coupe's low-slung driving position, too, and there's a wide range of adjustment for the seat and steering wheel to help you fine-tune things. However, you won't be such a fan of the Coupe's rubbish rear visibility. Before you add any of the options that you inevitably will, the Cooper S costs 19,780 that's 3140 more than the Cooper. However, as we've observed, the Cooper S is far closer to the JCW than it is to the Cooper for character and entertainment value. With the JCW costing 23,800, settling for the Cooper S will save you 4020. The price of the Cooper S also compares well with those of rival coupes. Both the Peugeot RCZ 1.6 THP 156 Sport and the VW Scirocco 1.4 TSI 160 cost around 1500 more, although the Scirocco has two extra useable seats. Still, neither has quite as much power as the Mini. The Mini's fuel economy and emissions of 48.7mpg and 136g/km are also marginally better than those of its major rivals, and so are its resale values. So, the Cooper S Coupe is a car you can buy with your head as well as your heart. Not only does the Cooper S become our favourite version of the Mini Coupe, but it also becomes one of the best cars in the coupe class.